Easy Lock is the easiest way for locking / unlocking your phone. Quick. Smooth. Elegant. Eliminates the cases of accidental screen or key presses! No more unwanted phone calls or battery drain because of WiFi or GPS turned on by mistake! - Starts automatically when your BlackBerry® is powered on and runs silently in the background. However, you can easily turn it off at any time. - Configurable background. Use one of the backgrounds coming with the application or select a picture from your device memory / SD card. 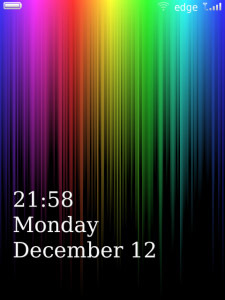 - Customizable widgets: clock, notifications (new emails, SMS, BBM etc. ), battery level and signal strength. - Option to disable auto locking on certain applications (either native or third-party). Very convenient for browsers, maps, readers and others.